A friend of my from UCSC introduced me to this group. The particular song was “Dizzy Blonde” (see below). I joked it sounded like a Nintendo Entertainment System (8-bit NES), that had a uncannily good guitar synth. Not all their music sounds 8-bit though, but it’s all great stuff! 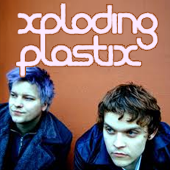 Xploding Plastix is a Norwegian two-man band playing Electrofunk/Big beat music with elements of jazz. Jens Petter Nilsen and Hallvard Wennersberg Hagen (formerly in Norwegian black metal band Kvist) formed the group in early 1999, and submitted their first demotape in 2000. I know, right? That and sports not heavy crime.